President Rivlin meets with Japanese Foreign Minsiter Tarō Kōno in Jerusalem. 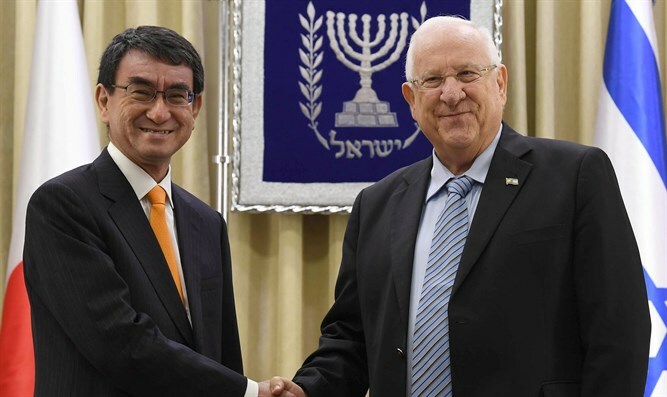 Israeli President Reuven Rivlin on Monday held a working meeting at his residence in Jerusalem with Japanese Foreign Minister, Tarō Kōno, who is visiting Israel. Rivlin welcomed Kōno on the first official visit in his current role, praising the importance of the strong relationship between the two countries and speaking of the importance of building confidence as the only way to find a solution to the conflict between Israel and the Palestinian Authority. "I know the good relationship between your people, and the influence you have with the Palestinians," Rivlin said. "They have to understand that we are here, that the Jewish people has returned to our homeland and there is no other homeland for the Jewish people but the State of Israel, and the Land of Israel." He urged Kōno to convey to the Palestinian Authority the importance of direct negotiations with Israel. Rivlin also asked Kōno to send his best wishes to the Emperor of Japan, and expressed his hope the Emperor Akihito would be able to visit Israel in the short time before he was due to retire from his duties in 2019. "For us, Tokyo is absolutely the only capital of Japan, and Jerusalem is the capital of State of Israel," Rivlin concluded. Kōno thanked Rivlin and spoke of the increase in trade and investment between the two countries in recent years. "Investment has probably increased twenty-fold in the last three years, so the bilateral relationship is rapidly expanding," Kōno noted, adding his hope that a member of the Imperial House would be able to visit the region soon, and that Rivlin would be able to visit Tokyo. Noting the significant increase in the cooperation and delegations between the two countries, Kōno said, "We hope to have a direct flight connection sometime soon. The legal framework is there, and we are hoping that the airlines will view favorably having a direct connection." "Japan regards Israel as a country full of talent, not just a state about technology, but humanity, art, and science, and I hope to increase the exchange of people between our two countries." Kōno concluded by speaking about Japan’s willingness to play a part in developing agricultural and environmental cooperation between the different peoples of the region, and thanked Rivlin for his support on the issue.